A while back, I saw a report that a bunch of monks had gotten into a brawl in the Church of the Holy Sepulchre in Jerusalem. 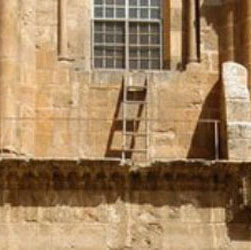 I was horrified—well, not entirely—at this breach of the peace in one of Christianity’s holiest shrines, believed to be the site of Jesus’ tomb, but it turns out this sort of thing happens fairly often. The problem is that the place is so holy that everybody wants a piece of it, and there are six Christian denominations—Armenian, Coptic, Ethiopian, Greek Orthodox, Roman Catholic, and Syriac Orthodox—that each claim a legal right to one. All of them guard their pieces with great zeal, so much so that they won’t allow unsupervised walking through their zones, in case that might be seen as weakening their claim. As MSNBC reported, blood was actually drawn in this fight: “‘We were keeping resistance so that the procession could not pass through … and establish a right that they don’t have,’ said a young Greek Orthodox monk with a cut next to his left eye.” He said he had sustained the wound when an Armenian monk sucker-punched him and broke his glasses. Each side said the other had started it, and a police spokesman said two arrests were made, one from each side. (I guess this is like “offsetting penalties” in football). 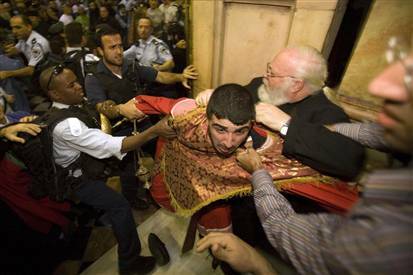 The two monks were carted away in handcuffs, as riot police with assault rifles crowded into the Church of the Holy Sepulchre. Disputes over ownership and jurisdiction at the site go back centuries (further if you count the Crusades, which you probably should). During Ottoman times, control alternated between the Franciscans and the Orthodox, depending on who the Ottomans liked at the time, although according to Wikipedia “outright bribery and violent clashes were not uncommon.” Eventually the Ottomans got sick of it all and officially divided the site. That “status quo” order is still the underlying basis for control today, 250 years later. 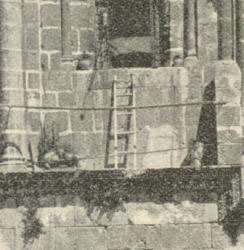 In 2002, a Coptic monk whose job is to sit on the roof to express the Coptics’ claims to the Ethiopian part of the roof (!) moved his chair into the shade. The Ethopians objected to this, and a fight erupted that put eleven monks in the hospital. Under the status quo agreement, nothing can be done in common areas without consent of all of the communities. Surprise—doesn’t happen. One result of this is that even desperately needed maintenance can’t be carried out, so that parts of the structure are in danger of collapsing. A rooftop monastery needs to be renovated. The church needs a fire exit—there is only one main door and sometimes thousands of pilgrims inside—but they can’t agree on where it should be. The Edicule itself has been held together by scaffolding since 1947, but nowhere is there less likely to be agreement about rebuilding plans. Oh, I forgot to mention that the Muslims are also involved (as well as the Jews, who of course control Jerusalem itself). Two Muslim families have had responsibility for the main entrance since it was assigned to them by Saladin in 1192, after he retook the city from the Crusaders. One family has control of the key, and the other is in charge of the door. Members of the two families meet in the morning and again in the evening. One guy brings the key, and the other actually uses it to lock and unlock the door. Again, this has been going on for over eight hundred years. So, the next time somebody claims that lawyers are the reason for all the bickering and pointless disputes in the world, you can tell them about the Church of the Holy Sepulchre. See also Chris Armstrong, “Divvying Up The Most Sacred Place,” Christianity Today (July 1, 2002).